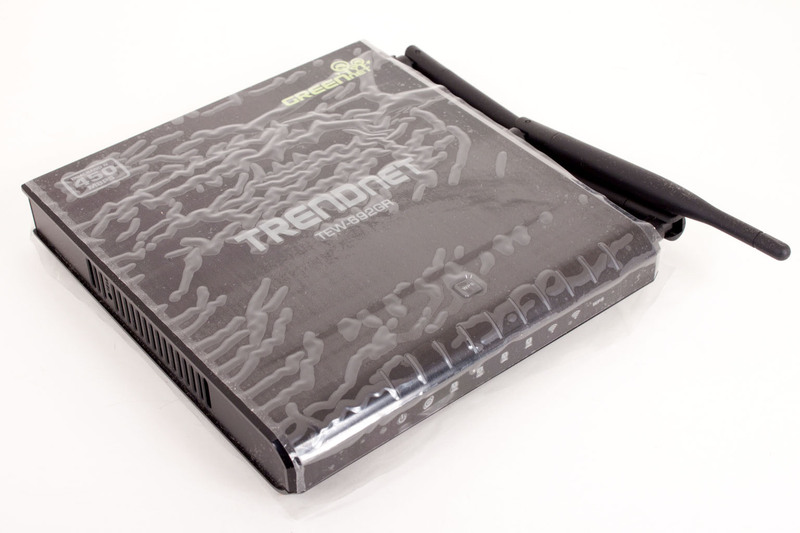 The box the TEW-692GR comes in is like any other TRENDNet box. That is not a bad thing (in fact they do have one of the better packages in the consumer networking market), it is just that we have seen these before. You get the typical product shot on the front with the name of the product in nice bold letters. Other items of interest are the Dual Band 450Mbps logo and the graph showing you where this product stands with others on the market (which you probably could guess). 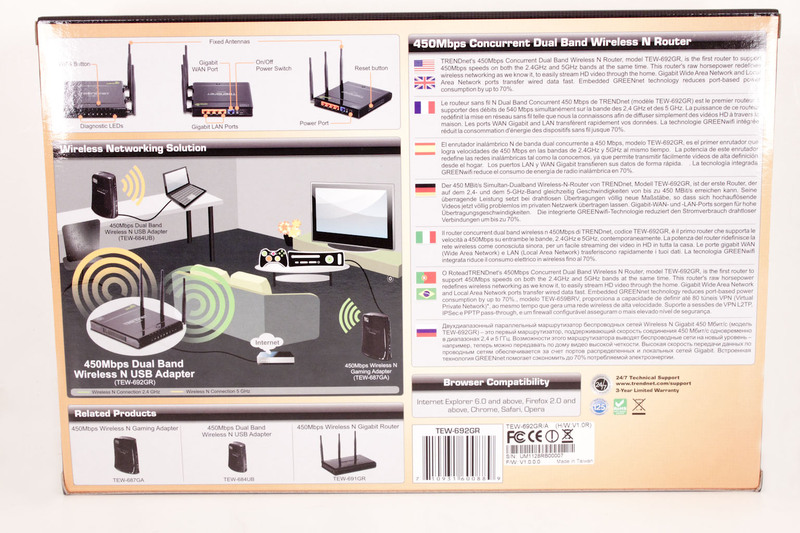 The back of the box has two diagrams one of the TEW-692GR (complete with labels) and another showing you where one would fit into a home network. Below that are some related products (which the marketing people are hoping you will buy too). 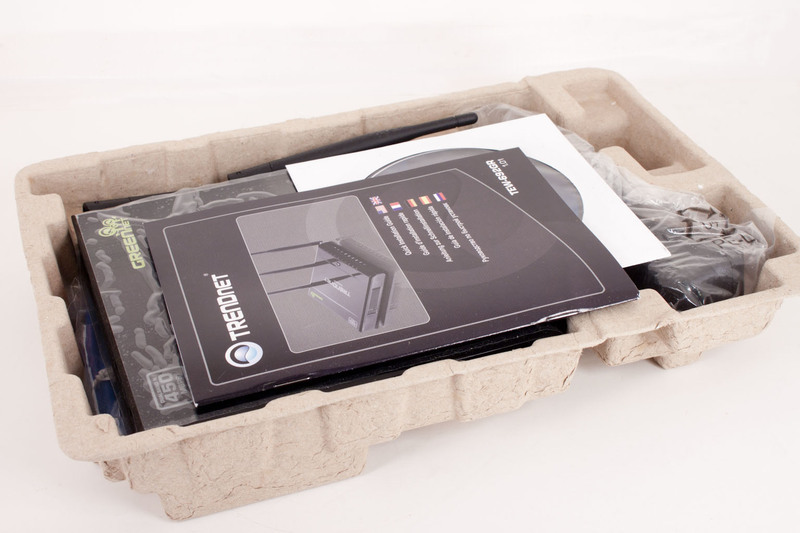 Inside the box is a tray of recycled material holding all of the goodies (and the TEW-692GR). As with most network devices the items that are included are utilitarian. You get a power cord, an Ethernet cable, a stand, a quick start guide, and a utilities DVD-ROM. Not fancy but everything you need to get going. 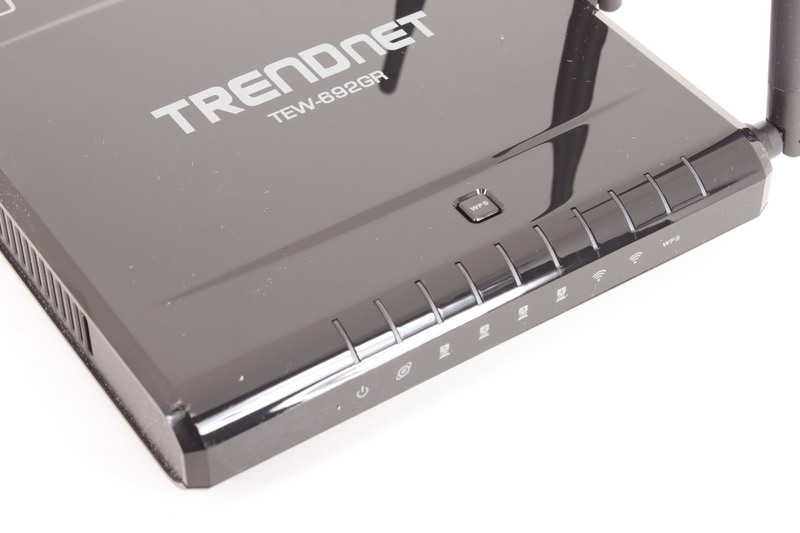 The TEW-692GR looks like most of the other TRENDNet routers we have tinkered with in the past. It has something of a wedge shape to it with beveled edges on the front and an open back. When you first pull it out of the box it will be covered in plastic to protect it from scratches and fingerprints. Oddly enough it also ships with the antenna pre-attached (and non-removable) along the side instead of the normal removable ones along the back. Once you get the protective plastic off the surface of the TEW-692GR is sleek and glossy. The front has LEDs for everything; you get Power, Internet, four LAN LEDs and also two Wireless LEDs one for 2.4GHz and the other for the 5GHz channel. These last two have different colors to differentiate them (2.4GHz is green and 5GHz is blue). The back is a little more normal with four GBe LAN ports and a single GBe WAN port. You see the large amount of dust? That is an after effect of the static from the plastic wrapping. I had just cleaned that before the picture and dust just seemed to fly towards it. Both sides of the TEW-692GR have decent sized vent holes for airflow. However, once you put this in the included stand the ones on the “bottom” get covers and air flow is a little more limited (but convection should still allow hot air to escape at the top). 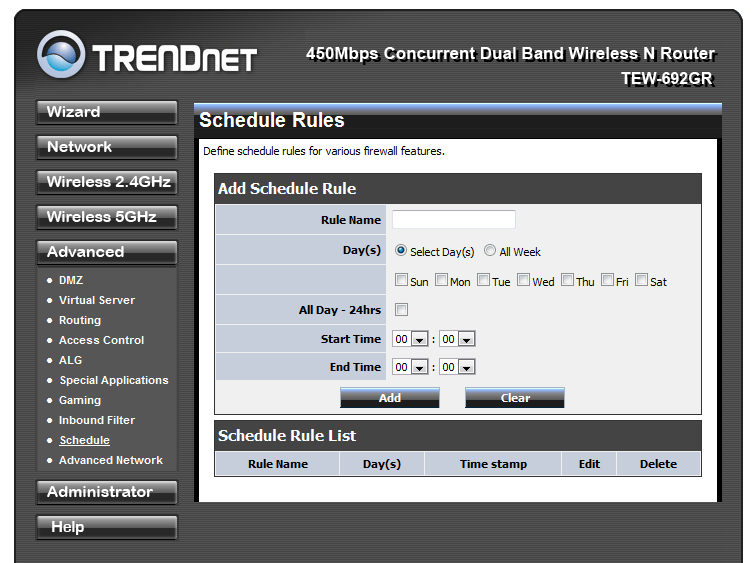 As we have mentioned before the TEW-692GR is a dual band concurrent router. This means that it is capable of operating in both the 2.4GHz and 5GHz bands at the same time. 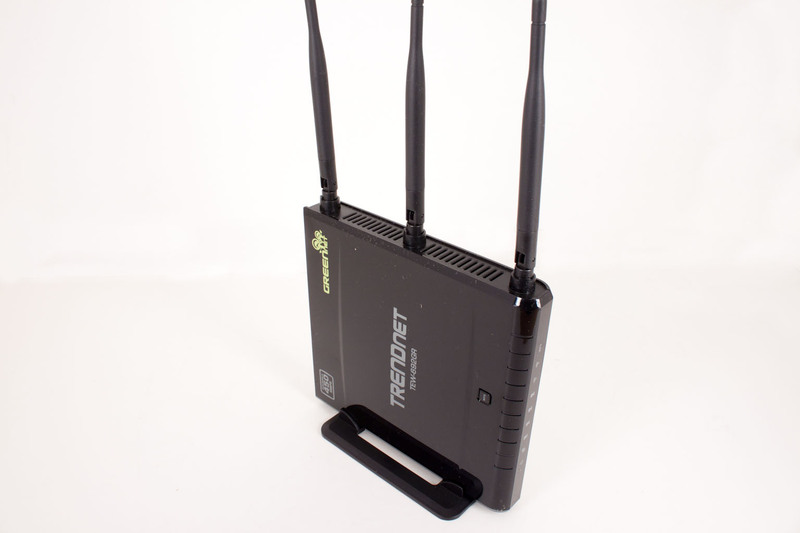 This capability is great as it allows you to segment your wireless traffic internally into two different frequency bands and even channels if you have the right type of adapter. It is also a GREENnet product which is supposed to give it better power efficiency than many other off-the-shelf products. 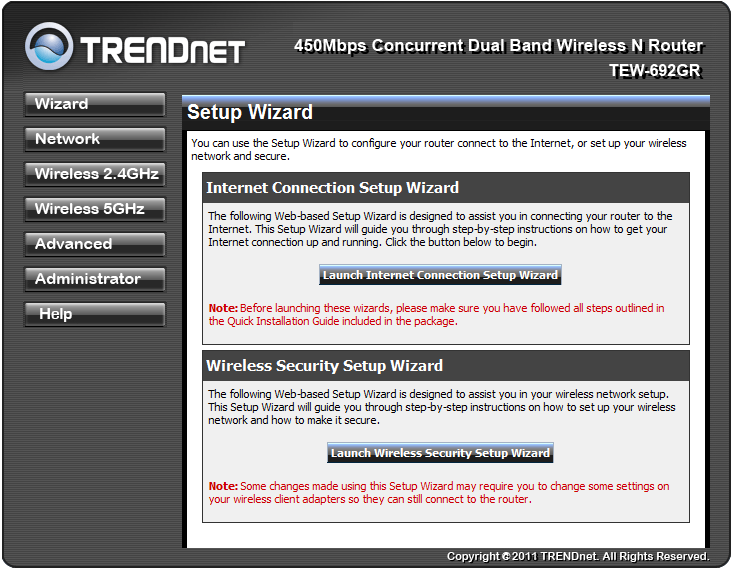 The technical specifications are shown below as copied from TRENDNet’s website. It is a nice product on paper, so now let’s see what it looks like in action. 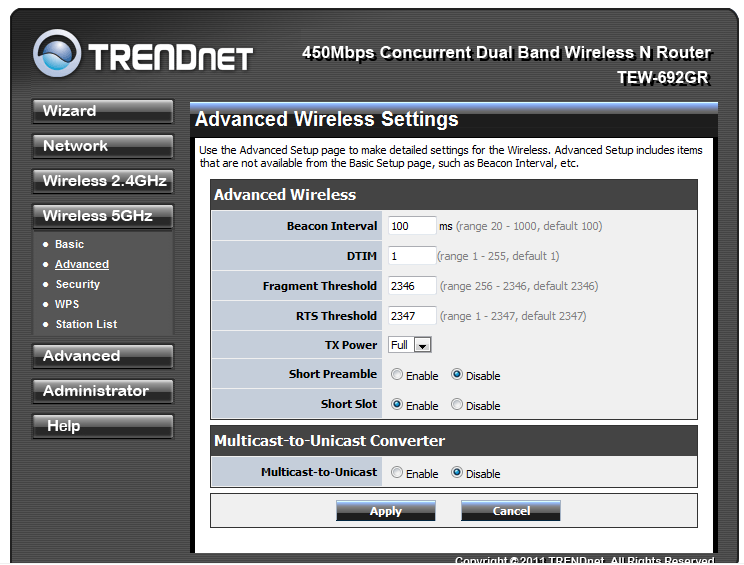 To setup the TEW-692GR you will need to take a few more steps than with some of TRENDNet’s other wireless products. 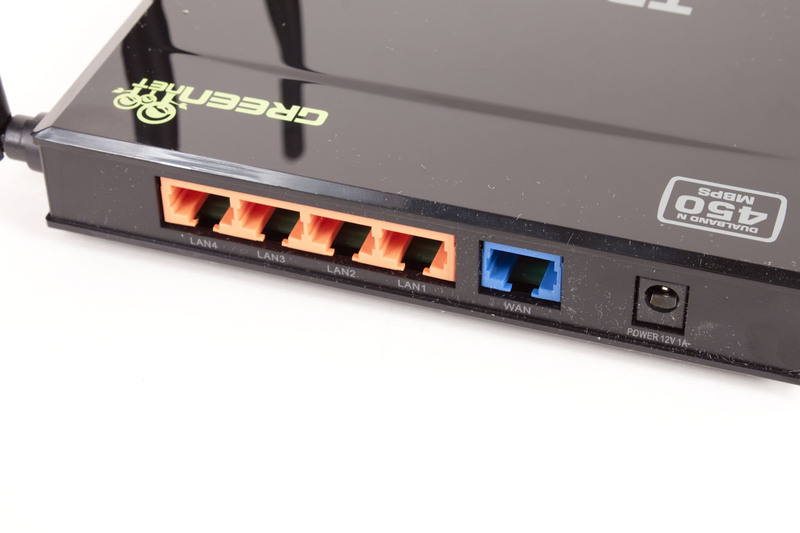 The first thing you need to do is to connect your system to one of the LAN ports (making sure your network card is set for DHCP) from there, power up the TEW-692GR and your system (laptop or desktop). Now once both are up and running you need to open up your web browser of choice and type http://192.168.10.1 and hit enter. It will ask you for a password (the default passwords are in the quick start guide. Type these in and you are in the WebUI and can configure your new toy. The first place you will head over to (if you want to get things running quickly) is to the Wizard button. 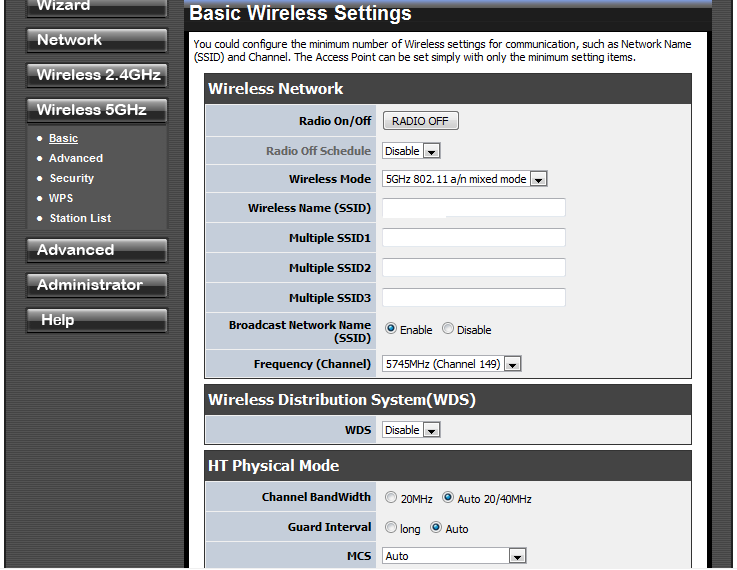 Here you will get the options to get the both your WAN and your Wireless LAN up and running in a few steps. Of course you will still want to poke around the rest of the WebUI to make sure things are secured and make sure you Change the Admin Password! So now that we have a base configuration let’s head into the WebUI to see what features are available to you with the TEW-692GR. 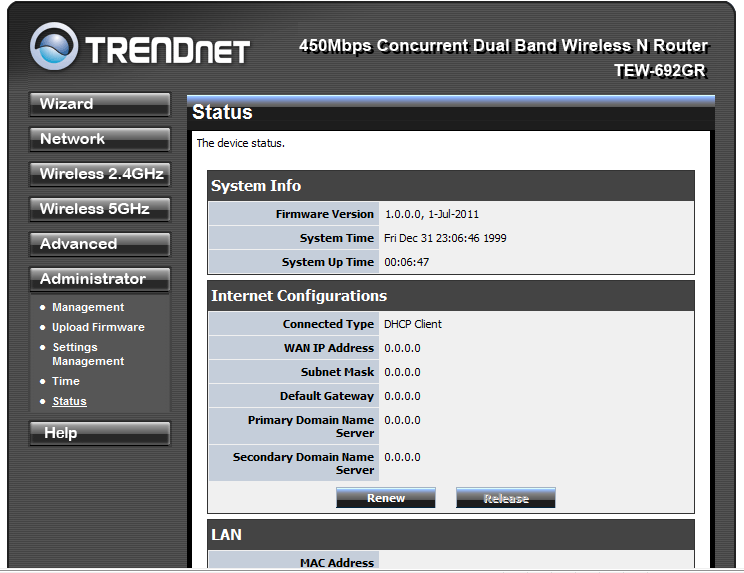 So now that we have that basic configuration we need to get in and setup the rest of our new router. 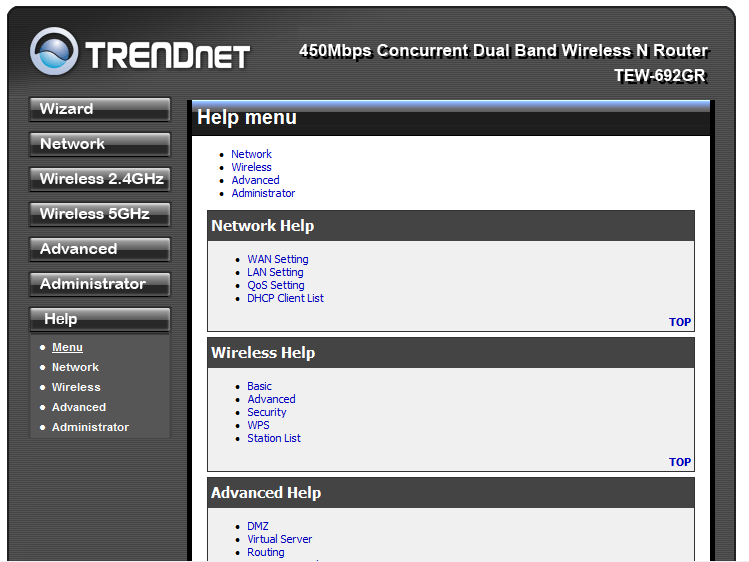 TRENDNet’s WebUI is very easy to navigate around so getting everything else setup should be simple enough. Once again you start off on the status page. From here you can head just about anywhere, but we are going to follow the buttons down and give you the details of each. Our first stop is the Network button. As you should have already run the WAN setup you can probably skip over that and dive right into the LAN configuration. 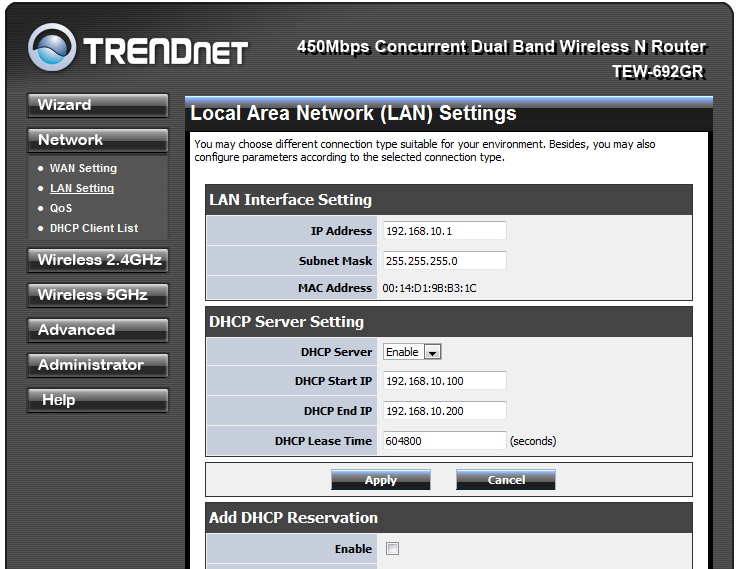 If not the WAN settings page is where you change the type of WAN connection you have (DHCP, PPOE, etc.) 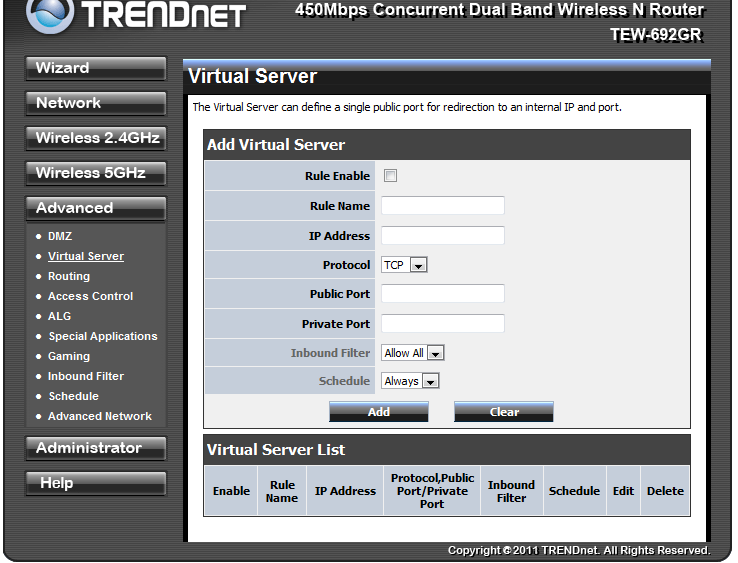 You can also setup the Host name if your ISP requires that. For those of you that have ISPs that require a single system connection you can clone the MAC address of the original system that was connected so you can continue to get an IP address. The LAN page is simple enough. 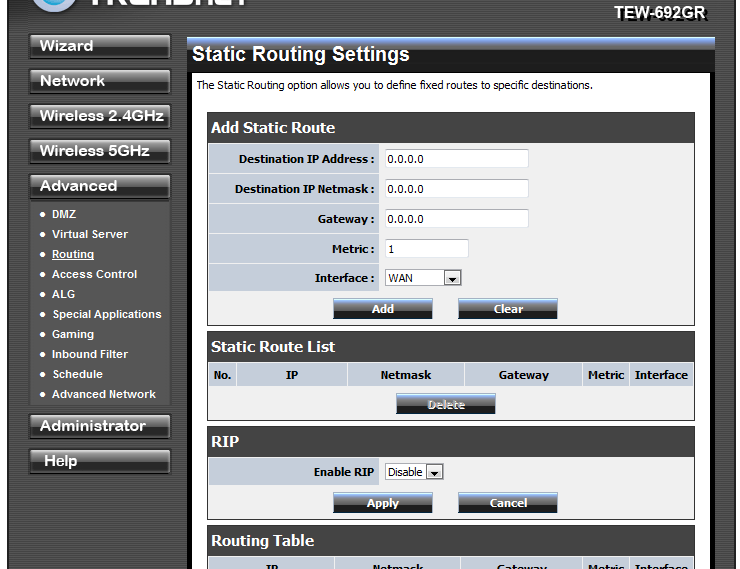 You setup the IP address of the TEW-692GR, the DHCP server (built into the router) and if you want you can also enable reservations so the same systems get the same IP every time. 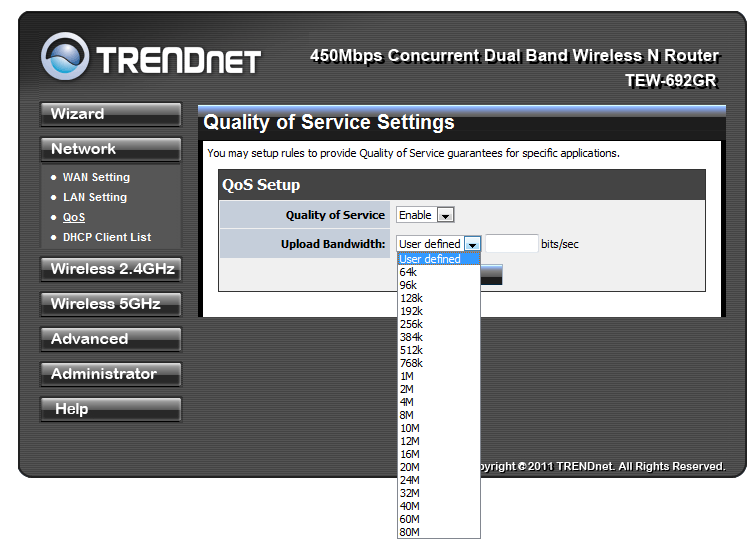 The Quality of Service (QoS) page lets you setup the amount of outgoing bandwidth available for you to transfer information up to the internet. The next button covers the 2.4GHz radio. Everything you need to setup (or even turn off) this radio is right here. 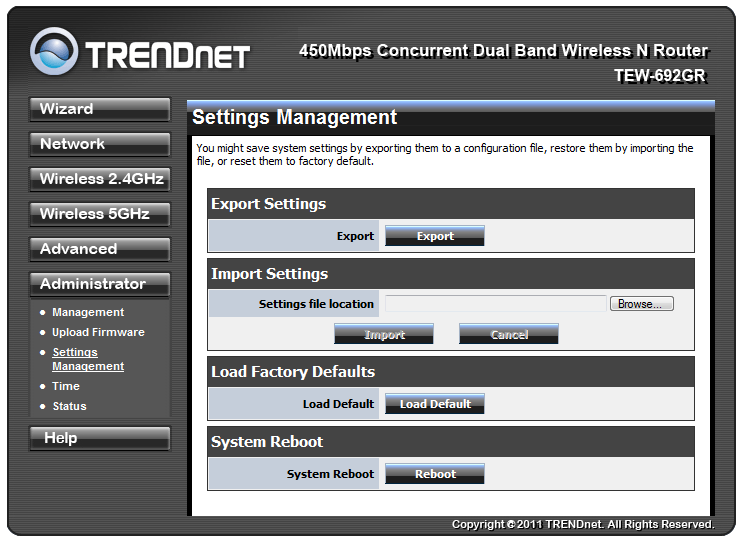 TRENDNet gives you a completely separate configuration for each of the two radios that are available in the TEW-692GR. 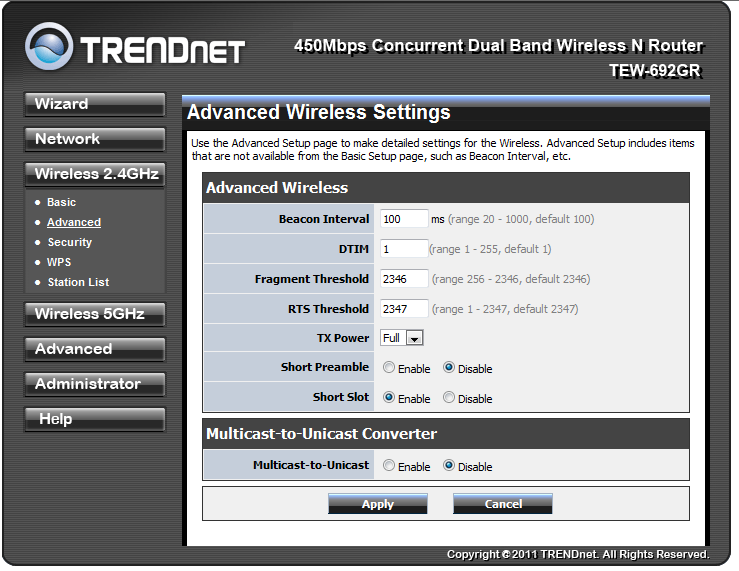 The primary page has the typical settings for a wireless router with frequency (channel), Wireless Mode (b/g/n) and the rest of the trimmings. The rest of the pages cover advanced functions of the internal radio, security (which you have plenty of options for), Wireless Protection Setup, and a station listing. 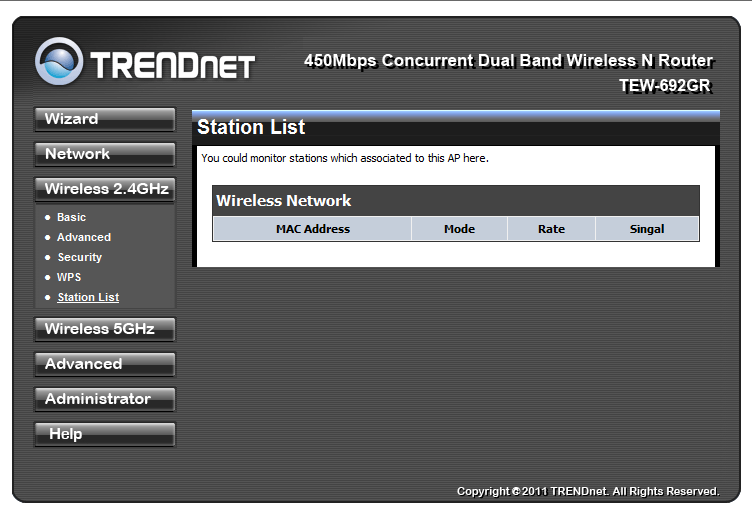 The station list shows all of the clients that are connected to each radio. 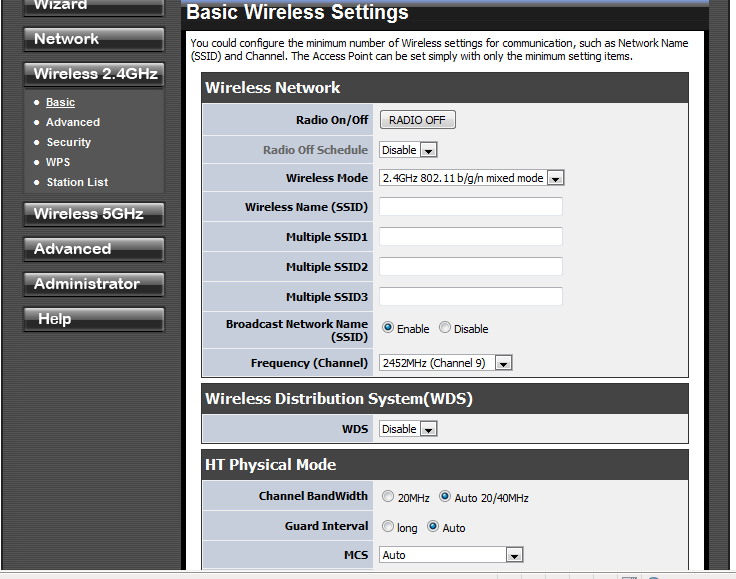 The same settings are available for the 5GHz radio. The next section is the advanced section, this is where you can find some of the really cool features of the TEW-692GR. 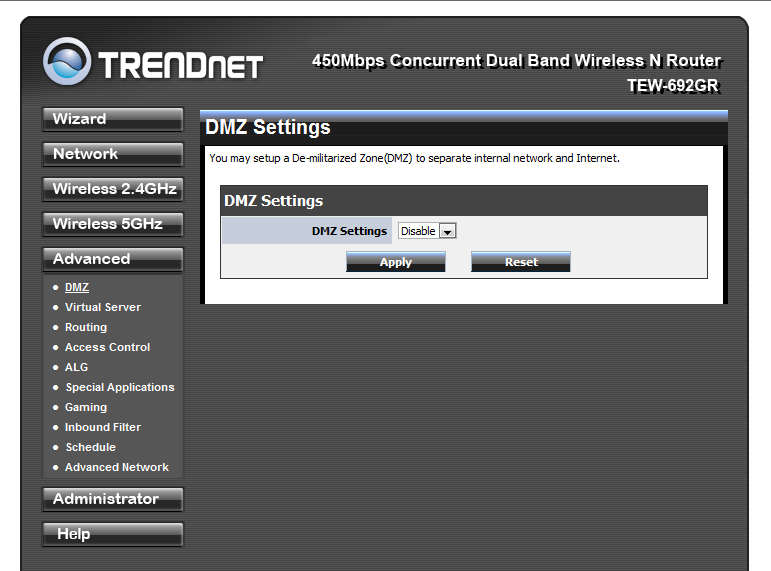 The first is the DMZ which allows you to expose a single system on your network to the internet. Now for most people this is not needed (most home users would not know why you would want this option) however, for some enthusiasts this will be a pretty cool option. The DMZ also goes along with the next option on the list. This is the virtual server listing. 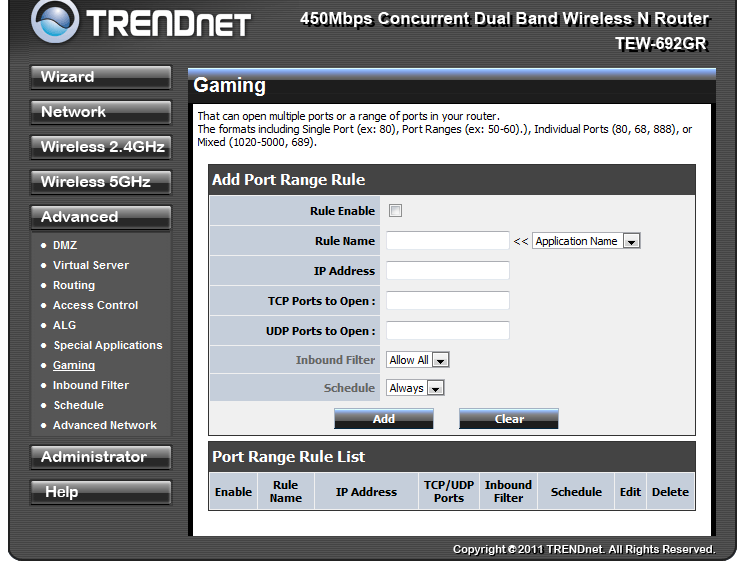 Here you can setup your router to forward certain systems inside your network. For example; if you had an FTP server (or a workstation running that service) you can allow all FTP traffic coming to your external IP address to be forwarded to the system directly. You can also do port mapping with this option. The next two options Routing and Access Control are very self-explanatory. Routing is what it says it is and really should only be changed if you have multiple networks and need to rout traffic between them. 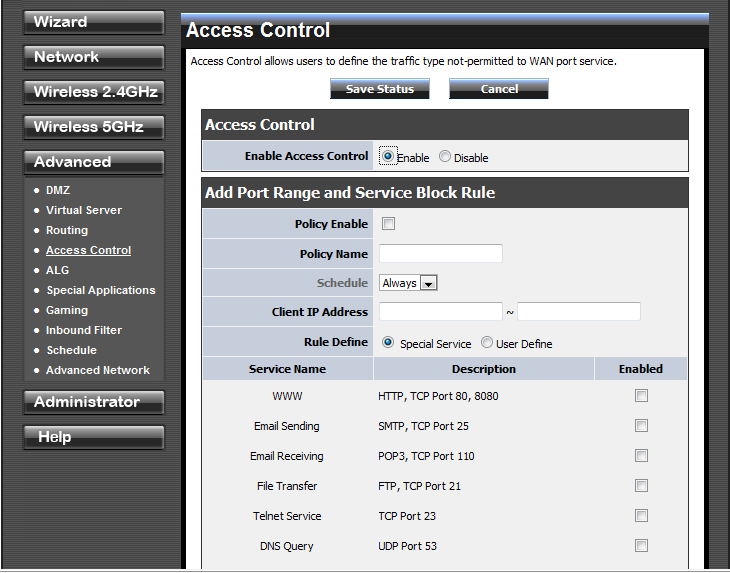 Access Control lets you block certain services for clients inside your network, (this is great for kids). The Application Layer Gateway (ALG) is good for blocking specific applications from getting through the firewall even if they are requested internally. The Specialty Applications page is useful for setting up a port or range of ports that will open only when a requested packet hits the firewall. It is more secure than leaving a port open all the time, but is also not always reliable. 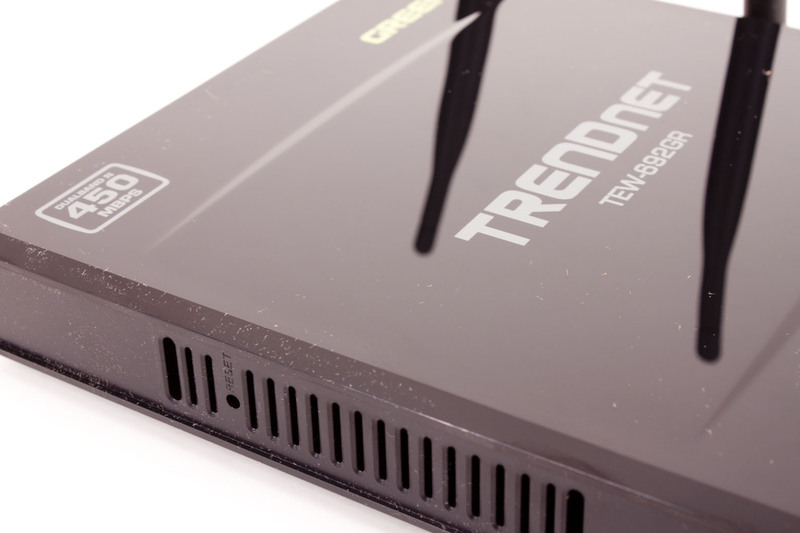 The TEW-692GR is actually a gaming router (it’s what the GR stands for). 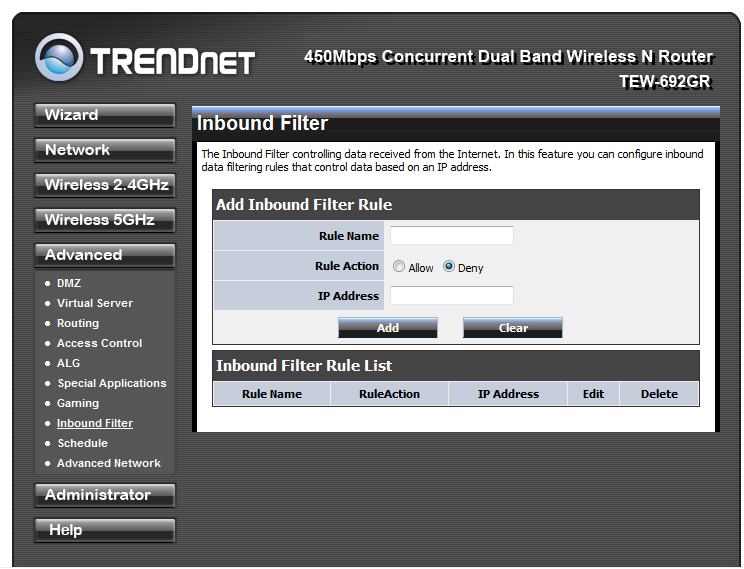 AS such there is a gaming page where you can setup rules to prioritize certain traffic through the firewall. This is really nothing more than a specialized form of QoS for the consumer. 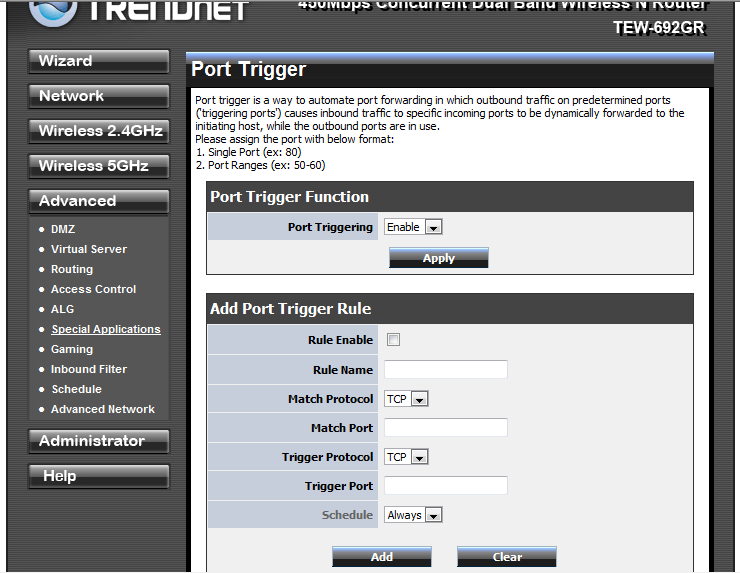 By selecting the application and the port the router looks at the traffic destined for that port and also returning on that port. When it sees this it gives it priority through the firewall (which makes your gaming better). The inbound filter rule lets you block specific traffic from a certain address. The schedule is exactly what it says it is, you can schedule certain rules to work during certain times of the day (or week). It is nice if you are setting up internet blocks for your kids as you can setup certain times and days for the internet to be unavailable. 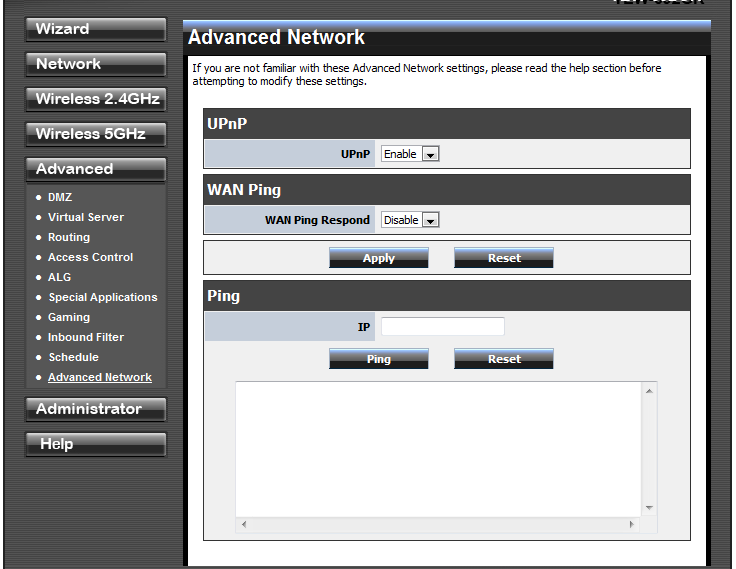 The Advanced Network page is really not all that advanced, you get the option to block WAN side pings (this should be turned on), enable or disable Universal Plug and Play and also ping an external address. The administration pages control the more mundane management options. 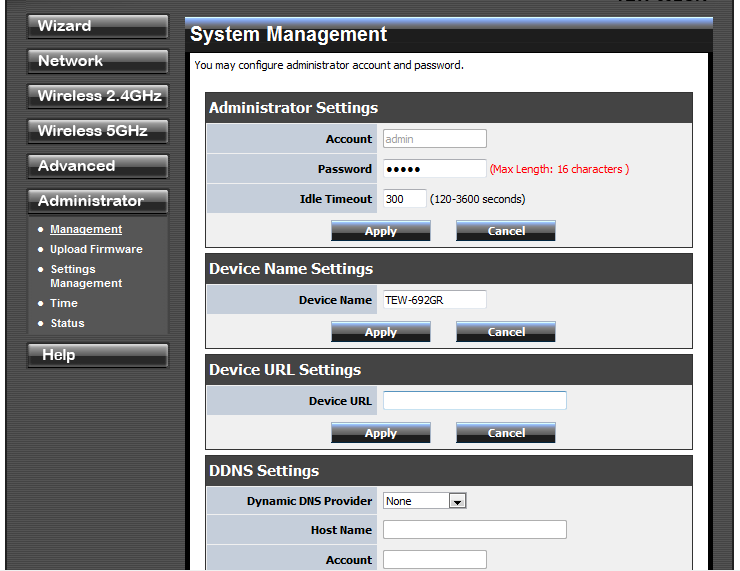 You can control things like the time settings, the admin password, upload new firmware; you know the type of thing. 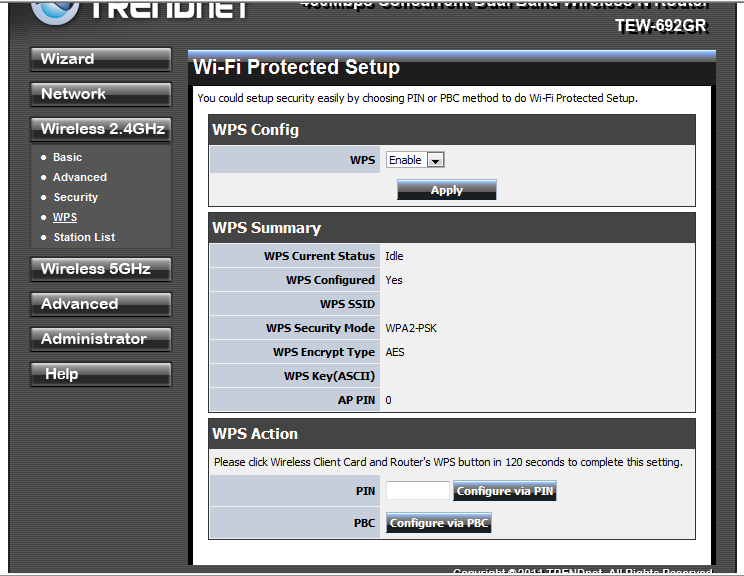 The Help pages are great if you are not familiar with setting up a firewall like the TEW-692GR. Over all the WebUI (although very difficult, or at least time consuming to explain) is well laid out and intuitive to use. For our performance testing with the TEW-692GR we needed to use a new adapter (one we have covered before) the TEW-684UB Dual Band 450Mbps USB adapter. 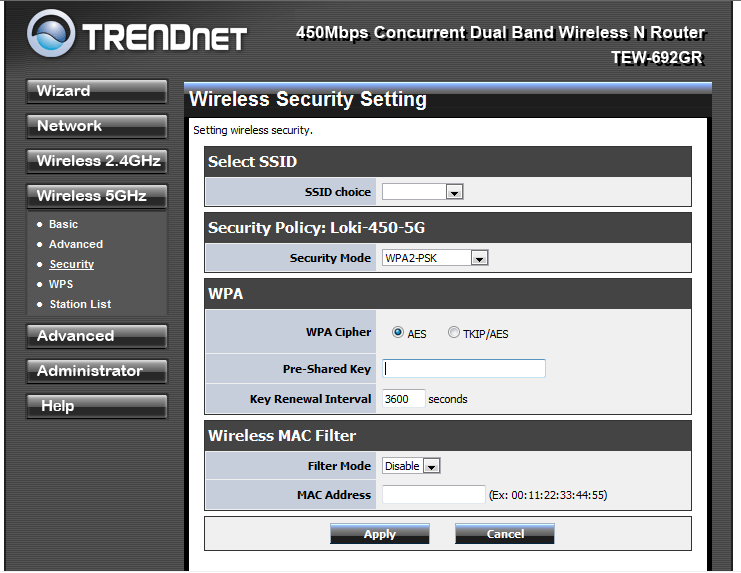 We tested this with the TEW-692GR along with our usual suspects (the built in Intel NIC etc). This way we were able to test both the 2.4GHz band and the 5GHz band. We did find that one of our regular adapters (the TEW-664UB) would not connect to either radio. It was immediately disconnected which was disappointing to say the least. Still we were able to get things going and get some performance numbers for you. 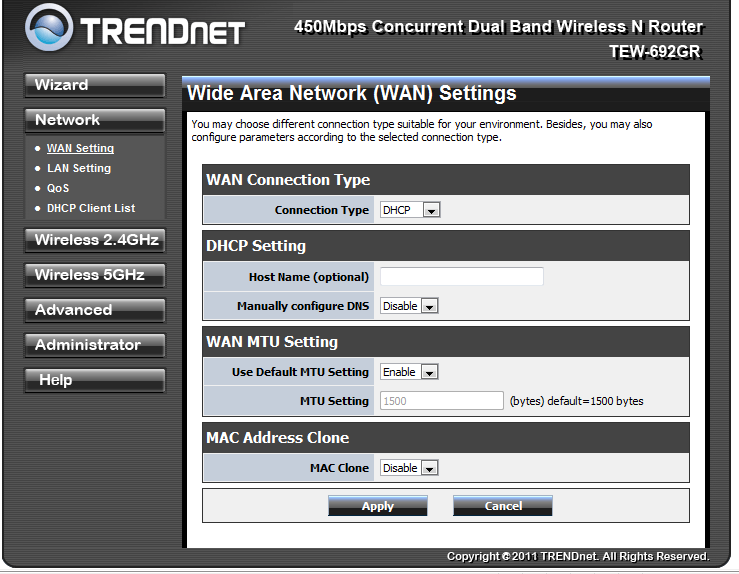 Unfortunately we only have two wireless routers that are capable of 450Mbps and both are TRENDNet. We are working on adding a few more to our stable here and will be presenting those performance numbers as we get them. 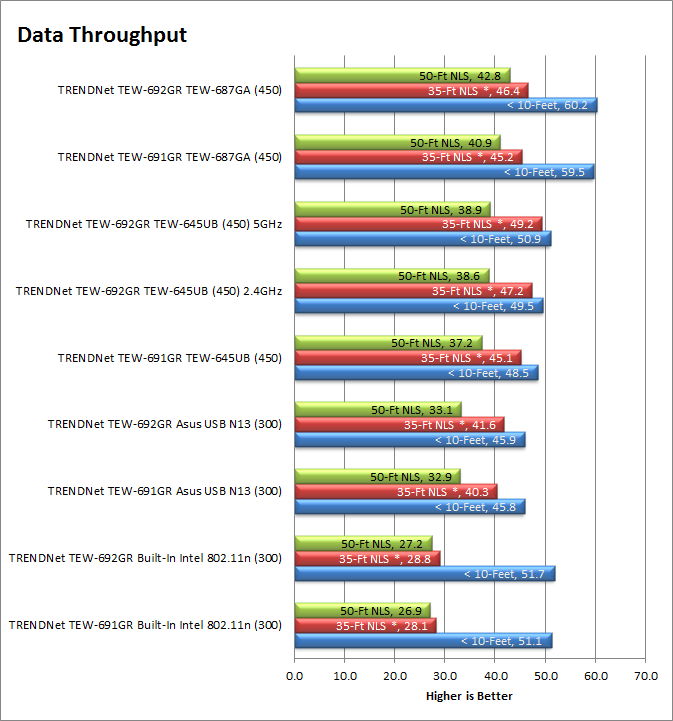 Even with only having one brand of router it is pretty easy to see that the newer TEW-692GR picks up the performance a little bit, but only a little bit. 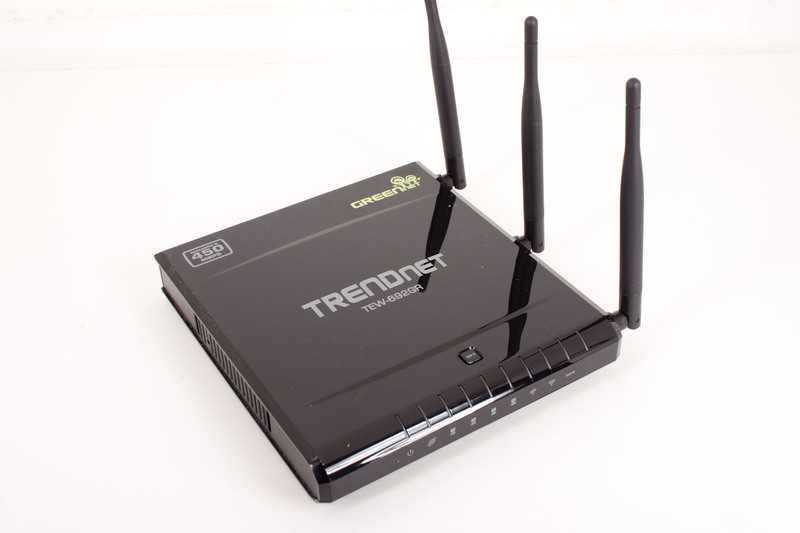 It really looks like you are not getting a tremendous speed boost here, but you are getting the advantage of running concurrent wireless networks which can help keep your performance up when there are multiple systems connected. The range on the TEW-692GR was good when running 2.4GHz. I was able to connect and still get decent speeds (above 10Mbps) even at over 75 Feet away (and through walls). This is actually a little better than the TEW-691GR. Although I was able to connect my speed and performance was not as good. Using the same test at 5GHz my range extended a little and put me out to roughly 85 Feet with the same speed (around 10Mbps). Link Speed is something of a misleading number, but is still important to see. After all if you link is only 54Mbps you are not going to get more than that (no matter how hard you try). The problem with link speed is that not all adapters are made with the same chips in them or the same antenna. 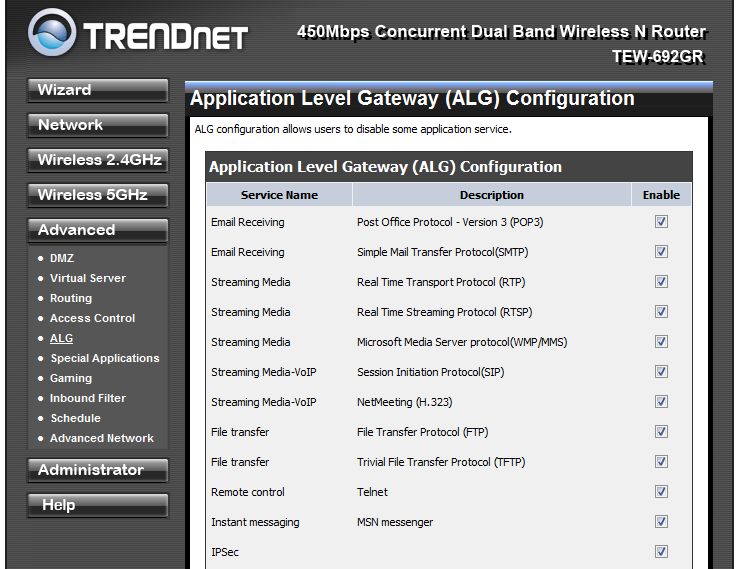 So while one adapter might show 220Mbps another might show the full 450. This is not the fault of the access point per se but it can be indicative of an issue. We found that with some wireless devices if we had b, g, and n enabled we would see a lower link speed. Fortunately the TEW-692GR did not have any issues like that. We were able to consistently get the 300 or 450 that we were supposed to. This link speed did decrease with range but for the most part inside the testing area we never dropped below 150Mbps. In terms of real world traffic the thing that really impressed us was not the speed (although that is good) it was the way the network handled multiple streams of traffic at the same time. During the testing I added six more systems, two were 450Mbps adapters (one 2.4GHz and one 5GHz) two more were 300Mbps (both 5GHz) and the last two were 300Mbps on the 2.4GHz band. With normally when watching Netflix or any other streaming media I cannot move large files around on the network. With the TEW-692GR I was able to move several 1GB+ files while watching a movie on Netflix, downloading apps to an Android Tablet, playing on-line games with two iPads (one iPad and one iPad2) all without missing a beat. That is impressive no matter how you look at it. Value is another very subjective topic. What is expensive to some might be a deal to others. You can look at this topic in multiple ways. One is raw price and the other is what you get for the money. Each is accurate and both are correct ways to look at price/value. We tend to look at features, performance and real-property when we discuss value. However, we also take into account the raw cash cost of the item. As we mentioned above the TEW-692GR runs for around $135.00 from most e-tailers. This is a very good price considering what you are getting. You are getting two wireless routers for the price of one. 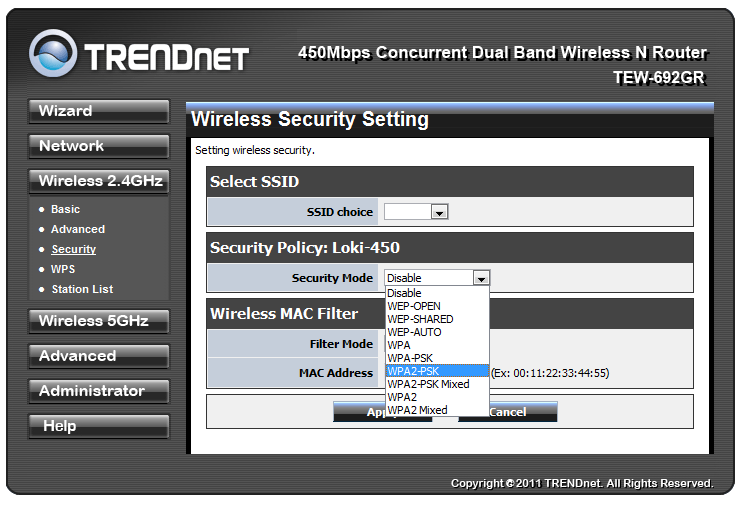 I am not talking about a device that is capable of multiple SSIDs (although it is that too), but one that has two separate radios on different frequencies that do not overlap and are each capable of getting 450Mbps of throughput that on top of the other features (the gaming profiles for QoS etc.) really add up and make this price more than acceptable. The world of networking can get pretty boring. There is not much new to talk about when you get down to it. 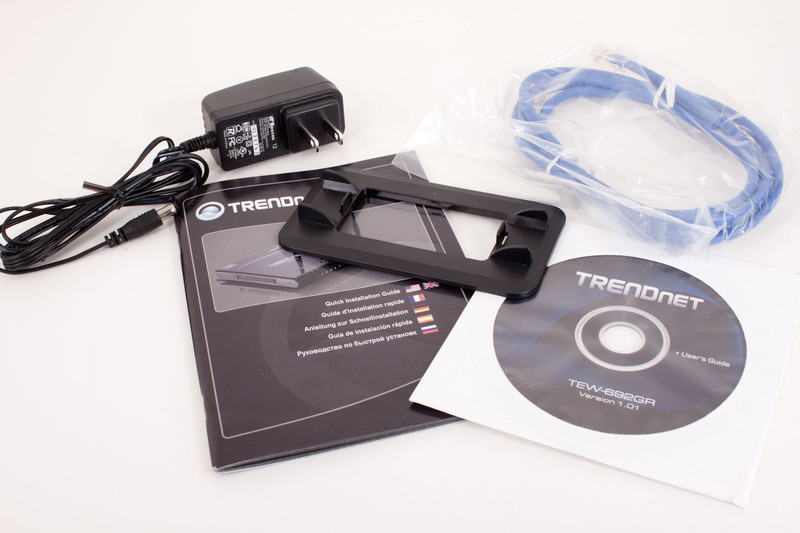 However, the TRENDNet TEW-692GR brings some excitement back to this rather dull area of the computer market. I really cannot stress enough how impressive it is to run multiple data streams like that and not see one or the other suffer. It did not matter what the traffic was either. The use of both radios concurrently enabled a much cleaner (and faster) wireless network. The price on the TEW-692GR is great considering the feature set (which includes more features than the average user will ever need). 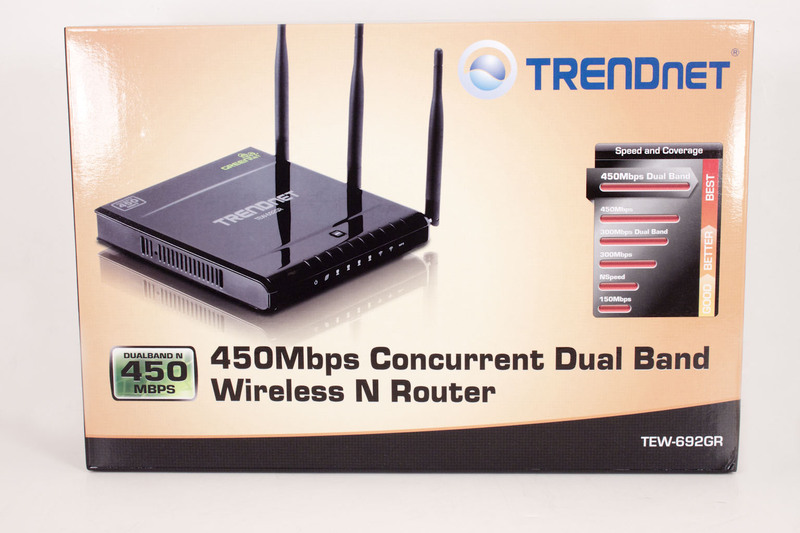 If you are looking to break into the 450Mbps wireless game, then here is your ticket.